In the existing 4000/4500 HP EMD Locomotives manufactured by Indian Railways, water act as a coolant. The water temperature is controlled by means of radiator banks and AC motor driven cooling fans. Radiator Cooling Fan motors used on existing 4000/4500 HP EMD Locomotives manufactured by Indian Railways, are of inverted squirrel cage, dual speed, single winding, 3-phase induction machines and are an integral part of the cooling fan assembly. 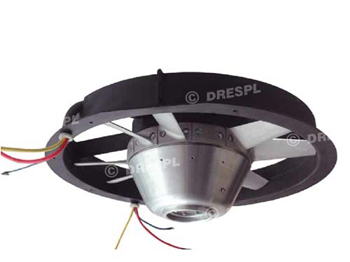 The term "inverted" indicates that these differ from the conventional squirrel cage motor in the way that the rotor is located outside of the stator. All the aluminum castings meet the quality requirements as per ASTME -155 level 1. All the machines are tested a per IEEE 112A/ IEC 60349 Pt-II, IS:4722-2001 and IS:4029-1967.